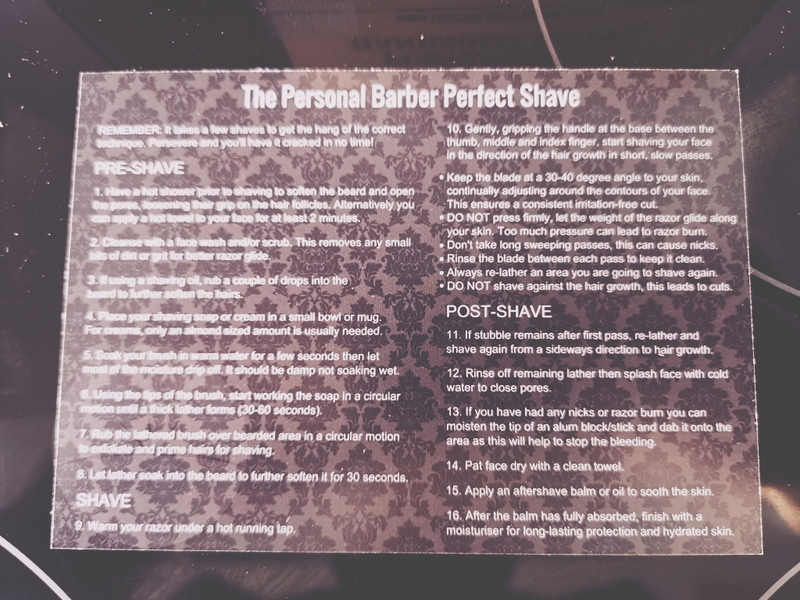 In this review we’re going to take a look at a subscription service from a company called The Personal Barber. I’ll be 37 this year, I’ve being shaving from when I was 15 or so. I remember waiting for my sideburns to grow so I’d look older. I was a massive Oasis fan at the time and wanted to look like Liam Gallagher. My shaving experience then was using a spare disposal blade that my dad gave me along with a tin of foam. Jumping forward over 22 years, I now use shaving gel with a disposal four blade razor that ends in Sword. 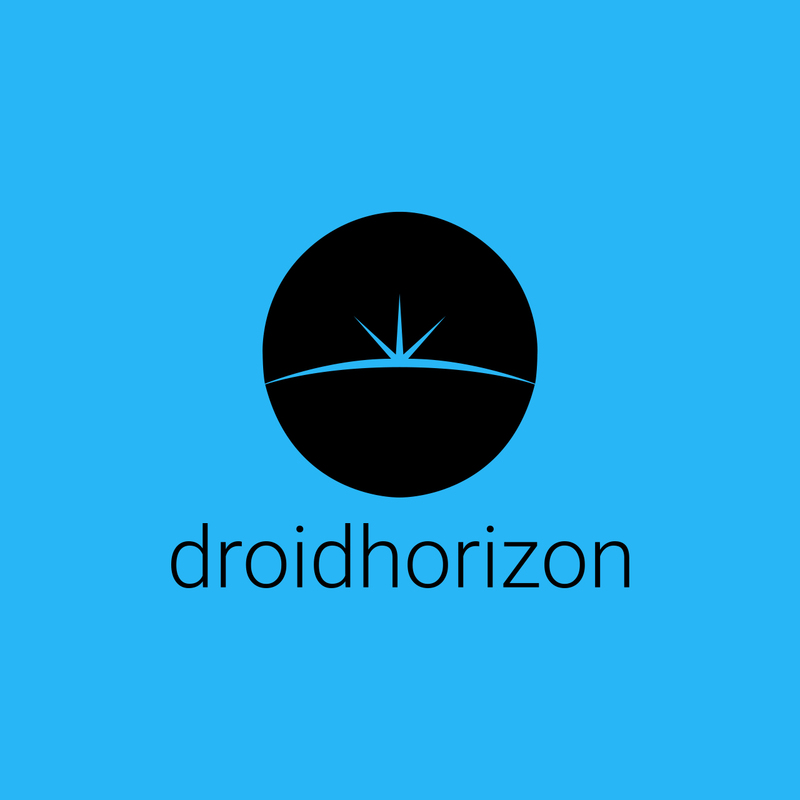 OK, not exactly exciting products, but, I don’t enjoy shaving and I’d probably grow a beard if the wife would let me…. 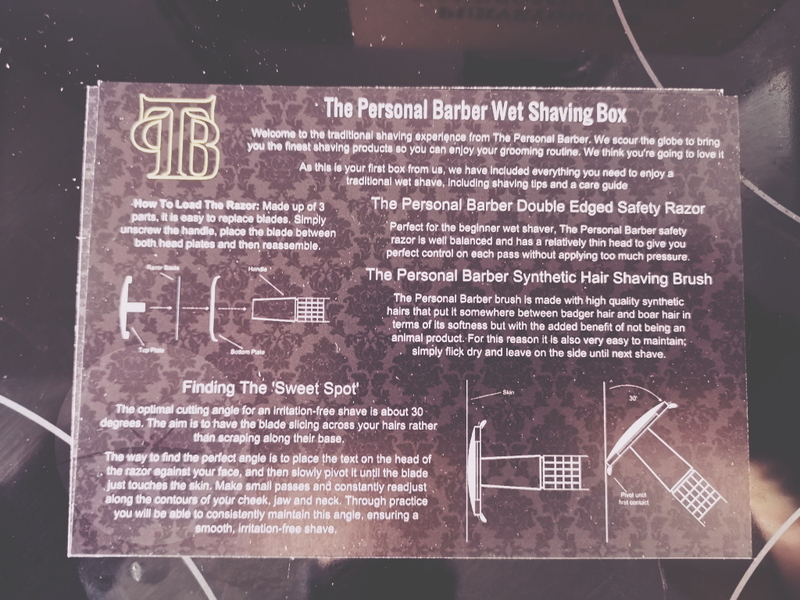 The Personal Barber offer a subscription service for wet shaving. 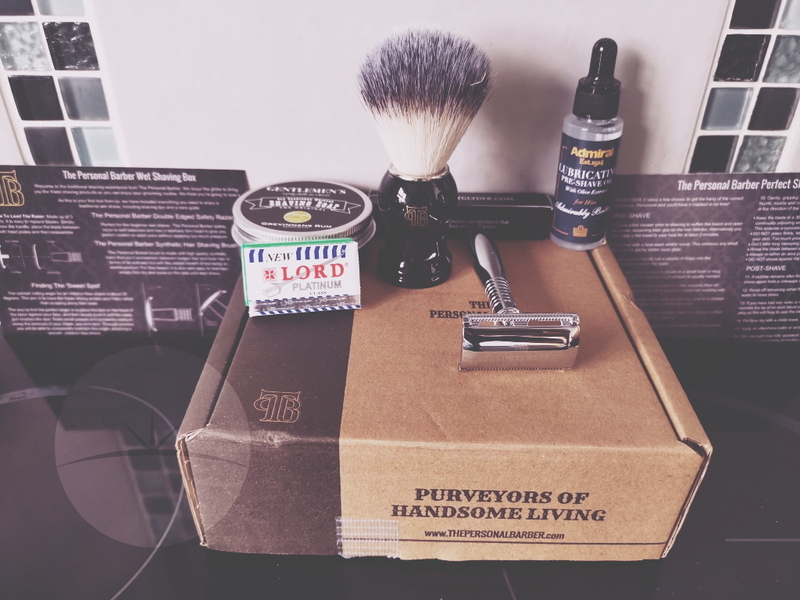 The company hand pick and test shaving products to send to us for a reasonable fee. When you first sign up, you’ll get to choose how often you shave, then, they can send you the supplies to last you a certain time, in my case.. I shave three times a week and they sent me twelve weeks worth. The subscription box changes from month to month, things can be added or removed and it looks like be bought individually from their shop. You can cancel anytime, there’s zero cancellation fee or minimum months and shipping is free in the UK. Grevinnan’s Rum is an artisanal soapmaker from Sweden that creates beautiful vegan, organic skincare products. This is a brand that really cares about ensuring they only use the finest quality ingredients that will benefit your skin and doesn’t come at the cost of the environment. That means no palm oil and no animal testing. Their old fashioned whipped shaving soap is a perfect example of this. Every soap has been lovingly made by hand and is suitable for all skin types. I absolutely love the smell of this stuff. I’ll never go back to foam or gel! 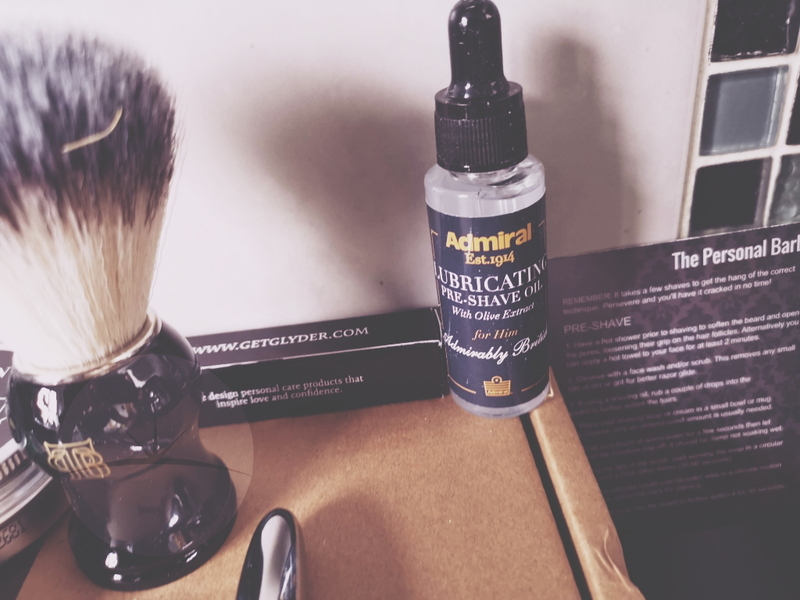 Admiral Grooming are an exciting British brand we featured last year when they first launched. They have an impressive set of high-end skincare products for men and so this time we’re featuring their pre-shave oil. We believe that adding a pre-shave oil to your routine will skyrocket your results, particularly if you have sensitive skin because it creates an extra barrier between the blade that reduces any chance of irritation. I’ll be honest, I didn’t notice any difference in using this with a couple of days beard growth. We’re very excited to introduce Glyder and their unique styptic balm which is quite possibly the first innovative alum product in a thousand years! A styptic pencil is usually made from Aluminium Potassium Sulfate in a powdered form that can be applied to nicks and cuts when shaving due to its ability to constrict the blood vessels and stop bleeding. They’re an essential product that all wet shavers need for those occasional accidents, but they tend to sting when applied. I did nick myself a few times, I just rubbed the Balm on it and it stopped the bleeding, it still stung a little bit though. Made in Russia as part of the 7 O’Clock range of Gillette blades. These are known as “Gillette Greens” to distinguish them from others within the 7 O’Clock range and are known for giving a consistent, smooth shave. Last 3-7 shaves per blade. I can’t say I noticed any difference in the type of blades provided. 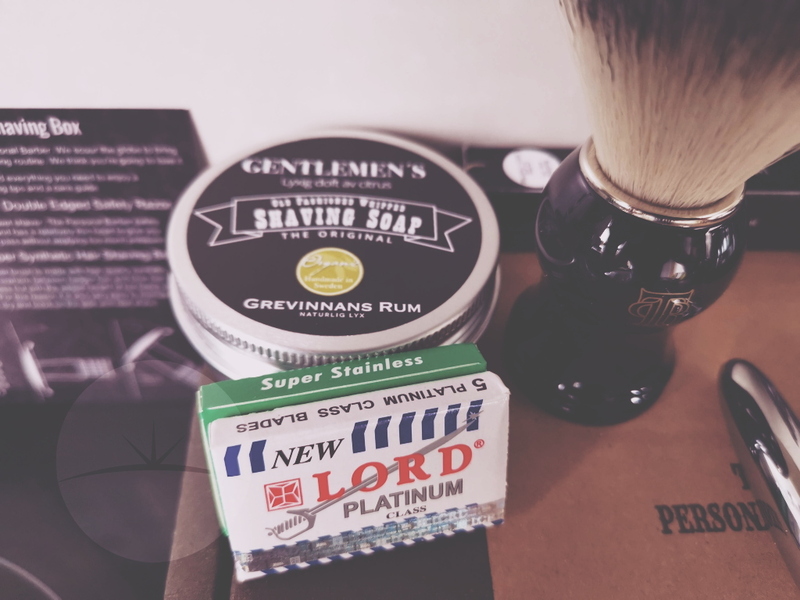 The Lord Platinum and Green 7 O’Clock offered me the same shaving experience, The information provided states that the blades last from 3 -7 shaves, I’m not really sure about that either. I wanted to change blades after the second shave, they just didn’t feel as sharp as I thought they would. For those wanting to start their wet shaving journey in the best way possible: Our premium safety razor. Ideal for all wet shavers, whether they’re beginners or experienced with a single blade. Heavier construction – The added weight makes it easier to let the razor do the work of gliding through the hairs whilst minimising tugging. Longer handle – Nearly twice as long as our basic safety razor making it perfect for those that have larger hands. A very forgiving blade-gap – Particularly useful for beginners as it means you don’t have to focus so much attention on the angle you hold the razor at. The Personal Barber’s signature shaving brush is made with high quality nylon hairs that put it somewhere between badger hair and boar hair in terms of softness but with the added benefit of not being an animal product. The base is a solid lacquered plastic with smooth finish and a chrome shoulder. Both parts have been assembled by hand to make sure the bristles retain their shape. Fantastic quality signature products! 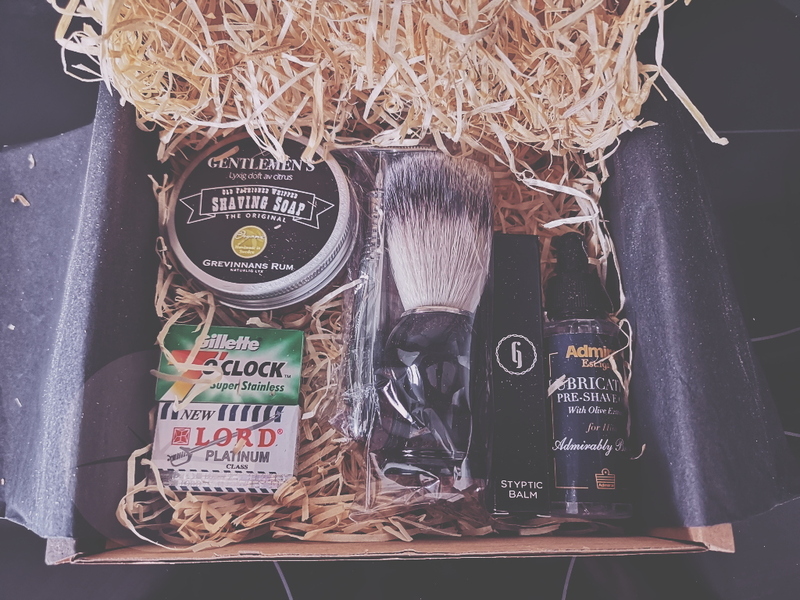 I’m a massive fan of the products in this shave kit although I’m not a massive fan of the old school safety razor it’s self. I’ve spent many years using the latest trend in shaving, from single, double, triple, quadruple and five blade razors. I keep coming back to the one I prefer. I think it’s because I prefer the way it glides over the skin when a safety razor really doesn’t. Old school shaving takes time to foam up, shave, foam up and lather again to get the bits you missed. I often got really irritated around my throat and you’ll get a cut every other shave if your not careful. This isn’t a bad mark against the products I tested just the style of shaving in general. I’d be 100% happy to recommend The Personal Barber, I can’t wait to see what they select next. Stay informed by following their Instagram and Facebook streams, if you decide to purchase a subscription, please use our special code to get 15% off your first order. Valid until midnight 28th February!